NEW YORK (Reuters Health) – A new study adds to evidence that people who get screened for colon cancer are less likely to end up dying of the disease. But it matters what doctor performs the test, researchers found. Older Americans who’d had a colonoscopy had the lowest chance of dying from colon cancer when the test was done by a gastroenterologist, compared to a surgeon or primary care doctor. Researchers said that could be because the digestive system specialists get extra training in colonoscopies, so they may have more experience spotting early signs of cancer than other docs. But it doesn’t mean patients should forgo colonoscopy if they can’t find a gastroenterologist. “If you have a colonoscopy and the only feasible option is to go to a surgeon, let’s say, it should be protective — the odds are they’re not going to miss anything significant,” said Dr. Gregory Cooper, a gastroenterologist with University Hospitals Case Medical Center in Cleveland, Ohio. “Having a colonoscopy by a non-gastroenterologist is probably still a lot better than not having one at all,” Cooper, who wasn’t involved in the research, told Reuters Health. For the new study, researchers led by Dr. Nancy Baxter from St. Michael’s Hospital and the University of Toronto looked at the Medicare billing records for more than 9,000 people who were diagnosed with colon cancer in their 70s and 80s and ultimately died of the disease. The research team used the records to determine which of those people, along with another 27,000 of the same age and gender without colon cancer, had gotten a colonoscopy in prior years. During a colonoscopy, a doctor uses a probe to check the intestine for pre-cancerous polyps and early signs of cancer, and can remove anything that looks worrisome. Overall, the findings are in line with previous research suggesting a benefit for screening: people who died of colon cancer were 60 percent less likely to have had a colonoscopy over the previous decade, compared to the colon cancer-free group. The majority of colonoscopies in the study were performed by gastroenterologists — which is consistent with current practice, according to Cooper. He said those specialists do about two-thirds of the exams in the United States, followed by surgeons. Compared to people who hadn’t been screened, those who had their colonoscopy done by a gastroenterologist were also least likely to die from colon cancer. They had a 65 percent lower risk of colon cancer death than the un-screened, compared to a 57 percent lower risk after screening by a primary care doctor and a 45 percent lower risk when colonoscopy was done by a surgeon. The study, published in the Journal of Clinical Oncology, can’t tell what caused that disparity, just as it can’t prove that the colonoscopies saved any lives. For example, “there may be real differences in patients who go to gastroenterologists versus other physicians and this may also have affected our results,” Baxter told Reuters Health in an email. Cooper said doctors training to be gastroenterologists do hundreds of colonoscopies in the years after medical school. 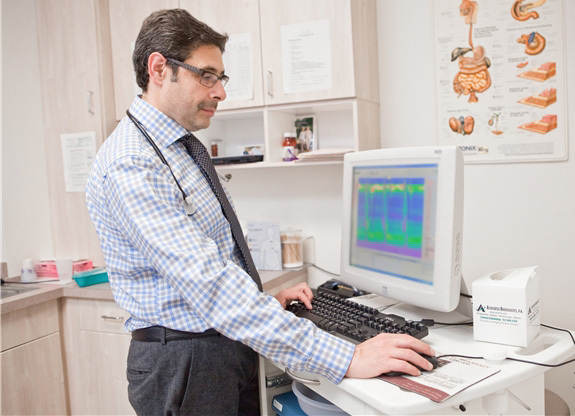 And what’s most important for thorough screening, he added, may be how many colonoscopies doctors have done in their career, how they were trained and their so-called adenoma detection rate — or how many of their procedures end with polyp removal. All of those are questions patients should feel free asking their doctors, Cooper said. “These quality metrics are more likely to separate good from poor performers better than specialty designation alone,” she said. SOURCE: http://bit.ly/KYr6mJ Journal of Clinical Oncology, online June 11, 2012.